Eugene - Oregon - U.S.A. 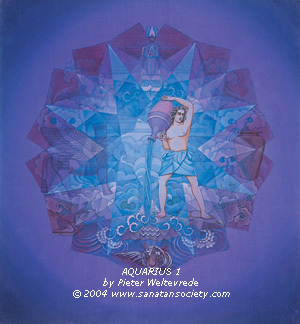 These Zodiac paintings have been created by Pieter Weltevrede using the wash painting technique on silk. 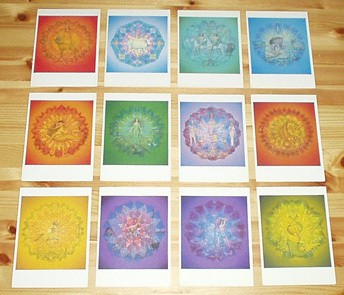 They were inspired by the astrology book by Selma Schepel and contain elements of all cultures, western, egyptian, hindu, etc..
Klik naar de website van Aurora en klik vervolgens op "Zoek-Verkoopunten"
Click to the Aurora website and click on "contact" to contact them by phone, mail or email. These asanas were performed by Ganga Puri, who lives in Hardwar-India if he is not traveling the world to teach the yoga of the Himalayas.